We report a chondromyxoid fibroma of the proximal phalanx of the left third toe in a 35 year old woman, a rare site for this tumor. The radiological appearance of a trabeculated lytic lesion with sclerotic margins and soft tissue extension raised the possibility of other entities such as intraosseous epidermoid cyst, aneurysmal bone cyst, chondroblastoma, osteoid osteoma and chondrosarcoma as well as infections like pyogenic, tuberculous and leprous dactylitis. 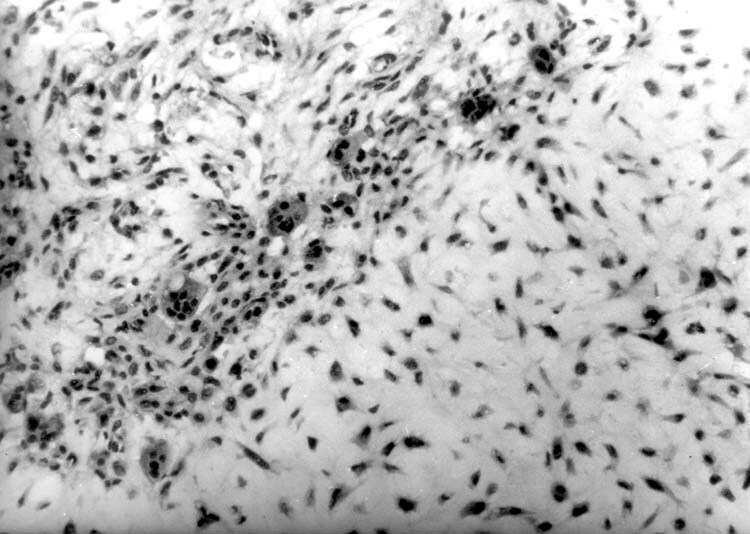 However the typical microscopic picture of lobules of cartilage separated by fibrocellular tissue and scattered osteoclasts confirmed the diagnosis. The tumor was successfully treated by curettage and bone grafting using a dorsal and plantar 2 incision technique and has no recurrence at 4 year follow up. In this article we present our experience with this case and discuss the differential diagnosis of a solitary lytic lesion in the phalanges of the toes. 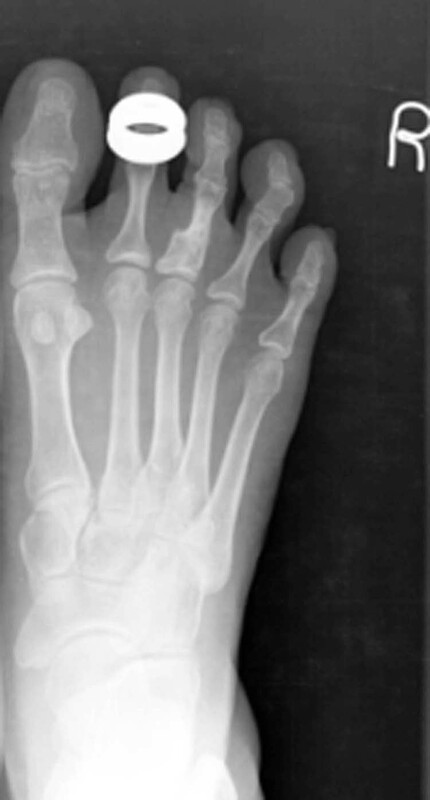 Figure 1 Eccentric expansile well defined lytic lesion showing intra lesional trabeculae and thinned medial cortex of the proximal phalanx of the third toe. Soft tissue swelling around the base of 3rd toe and widening of the webspaces is noted. A needle biopsy was reported as benign cartilaginous tumor. Through a combined dorsomedial and plantar approach the soft tissue component was excised. The tumor was thoroughly curetted after making a window over the dorsomedial aspect of the proximal phalanx. The plantar approach was added to ensure complete clearance of soft tissue extension which was predominantly on the plantar aspect. The cavity was then filled with cancellous bone graft harvested from the ipsilateral proximal tibia. Figure 4 Radiograph 4 years post op AP shows sclerosis and healed lesion. Figure 5 Oblique radiograph showing healed lesion 4 years post op. CMF in the long bones is usually metaphyseal and eccentrically located with well defined sclerotic margins on radiological evaluation. Lesions in the small bones are osteolytic with scalloped margins, an appearance which overlaps with Non-Ossifying Fibroma. Calcification within the lesion is visible in most cases. [3,4] There is attenuation, expansion or erosion of the overlying cortex. It usually occurs in the metaphyseal side of the growth plate which is situated proximally in the phalanges. Chondroblastoma can be partially or largely similar to CMF microscopically but is virtually unknown in the toes. 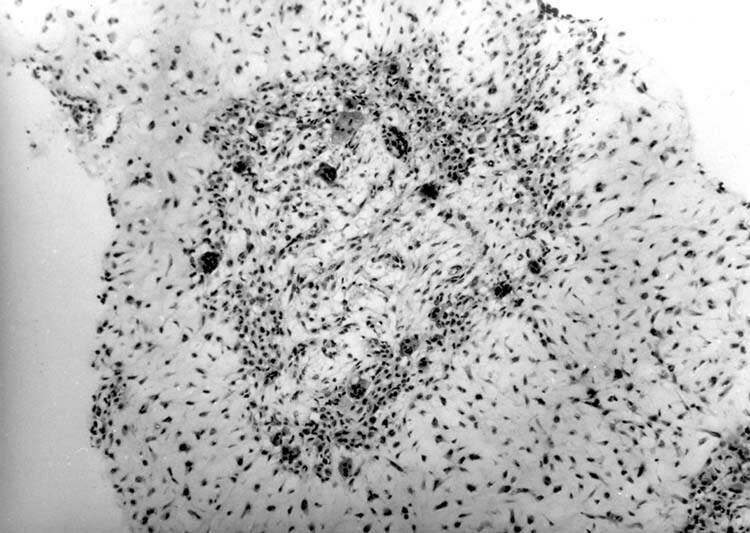 Among malignant bone tumours chondrosarcoma can be histologically difficult to distinguish from CMF. For making this differentiation the x-ray is critical as the radiological appearance of chondrosarcoma is aggressive, unlike that of CMF. The toes are also an extremely uncommon site for chondrosarcoma. Poorly defined lytic lesions can be associated with several pseudotumorous conditions such as osteomyelitis caused by Staphylococcus seen in diabetic patients. Tuberculous and leprous dactylitis are other condition which are clinically seen as phalangeal lesions. Radiologically the tuberculous lesion is central, lytic, cystic and expansive, and soft tissue extension may be seen. These are easily distinguished histologically. As our report shows, a needle biopsy is of great value in suggesting the diagnosis and can easily be carried out as an outpatient procedure. Conservative surgical treatment, such as curettage and bone grafting, appears to be ideal for CMF. In conclusion, a wide range of entities, including CMF, needs to be considered when confronted with a lytic lesion in the toe phalanx. Radiological features may help in distinguishing these conditions. Histopathology and microbiology provide a definitive diagnosis. A thorough surgical clearance is required to avoid recurrence in CMF. 1. Fletcher CDM, Unni KK, Mertens F (eds). Pathology and Genetics of Tumours of Soft Tissue and Bone, WHO Classification of Tumours, IARC Press, Lyon: 243 – 245, 2002. 2. Wu CT, Inwards CY, O’Laughlin S, Rock MG, Beabout JW, Unni KK. Chondromyxoid fibroma of bone: a clinicopathologic review of 278 cases. Hum Pathol 29 (5): 438 – 446, 1998. 3. Schajowicz F , Gallardo H .Chondromyxoid fibroma (fibromyxoid chondroma) of bone. A clinico-pathological study of thirty-two cases.J Bone Joint Surg. 53B (2): 198-216,1971. 4. Sharma H.,Jane M J, Reid R. Chondromyxoid fibroma of the foot and ankle: 40 years’ Scottish bone tumour registry experience. Int Orthop. 30(3): 205 – 209, 2006. 5. Wang BY, Eisler J, Springfield D, Klein MJ. Intraosseous Epidermoid Inclusion Cyst in a Great Toe. A Case Report and Review of the Literature. Arch Pathol Lab Med. 27 (7): 298 – 300, 2003. 6. Olivieri .I.,Scarano E,Padula A,Giasi V,Priolo F. Dactylitis,a term for different digit diseases. Scand J Rheumatol. 35(5): 333 – 340, 2006. Christian Medical College Ida Scudder Road,Vellore 632 004.